Need gear that works as hard as you do? Our Chelsea Evolution pant gives you the best of two worlds – a durable material that also guaranties ease of movement. The 4-way stretch fabric in polyamide combined with key areas of Cordura® delivers on this promise. Modern fit, improved pocket solutions, extraordinary design lines combined with our iconic Chelsea features makes this your new best workmate. Join the Evolution. * No Purchase Necessary. For full rules, visit www.eRenovate.com. Contest closes at 11:59:59 p.m. EST on May 6th, 2019. 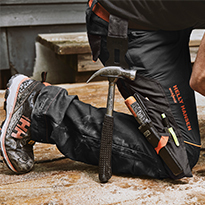 Ten (10) Prizes consisting of one (1) pair of Helly Hansen Chelsea Construction Pants, with an approximate retail value ("ARV") of $100.00 (CDN) will be chosen by random draw on May 7th, 2019 at 10:00:01 a.m. EST. Prize has no cash value. Winning entries will be announced on http://www.erenovate.com/ on May 8th, 2019. Odds of being selected depend on the total number of Eligible Entries received, and the number of correct answers in the Quiz. Qualifying entrants must be a resident of Canada, excluding the province of Quebec, and be age of majority to win. Correct answer to mathematical skill testing question may be required. Only one (1) Entry, and up to six (6) ballots per email is permitted during the contest period.